TORRANCE, Calif., March 19, 2019 /PRNewswire/ -- Phenomenex Inc., a global leader in the research and manufacture of advanced technologies for the separation sciences, expands its Lux chiral LC/SFC column family with a third new immobilized chiral media—Lux i-Amylose-3. During the manufacturing of Lux immobilized media, a chemical crosslinking is formed between the polysaccharide and silica support, resulting in a robust column that can withstand a wide range of strong solvents including DMSO, THF, Ethyl Acetate and DCM. This robustness allows for a potential increase in enantioselectivity as new strong solvent systems can provide more mobile phase options during method development. It also allows scientists to keep samples dissolved in strong solvents like DMSO/DCM. The new Lux i-Amylose-3 media is available in two particle sizes: 3 µm and 5 µm. The Lux 3 µm i-Amylose-3 is ideal for LC/SFC analytical work and chiral screening, while the larger iameter, Lux 5 µm i-Amylose-3, can be used for analysis and purification work as it is available in analytical (2.1-4.6 mm ID), semi-preparative (10 mm ID) and Axia™ pre-packed preparative columns (21.2-50 mm ID). "Our new i-Amylose-3 chiral selector, Amylose tris(3-chloro-5-methylphenylcarbamate), has complementary but distinct enantioselectivity in comparison to the Lux i-Amylose-1 and i-Cellulose-5 chiral selectors," explains Ryan Splitstone, Product Marketing Manager for Phenomenex. "It combines the 5-position methyl group of the i-Amylose-1 chiral selector with the electron-withdrawing potential of the 3-position chlorine group of the i-Cellulose-5. 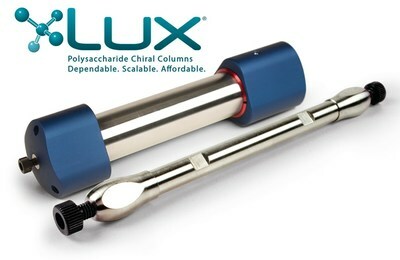 Along with strong solvent flexibility, the Lux i-Amylose-3 column's broad enantioselectivity promotes greater chiral separation success and is quickly becoming known as the go-to chiral column that customers start their screens with." With the addition of Lux i-Amylose-3, the Lux chiral column portfolio now includes three immobilized stationary phases and six coated chiral stationary phases. Altogether, this novel chiral column line delivers a wide and complementary range of enantioselectivity for even the most difficult chiral separation projects under normal phase, reversed phase, polar organic, polar ionic, and SFC separation modes. To learn more about this amazing new product, check out all the technical content on the Lux i-Amylose-3. And don't forget to browse Phenomenex's full chiral column portfolio!